"The Mystery ERA". That was the name the press had given in the first months of 1952 to the car that Leslie Johnson was preparing in order to "resurrect" the mythical name. Back in 1948, Leslie Johnson had bought the moribund ERA Ltd. from its pre-war co-founder and sponsor Humphrey Cook. It then moved the factory to Dunstable, doing automotive R & D work, and employed some excellent people. His first chief engineer was the pre-war technical head of Auto Union's GP team, Prof. Dr Robert Eberan von Eberhorst, which was later replaced at Dunstable by Cambridge engineering graduate David Hodkin. When Formula 1 died through lack of support even before the 1952 World Championship season began, the CSI ran its World Championship instead for 2-litre unsupercharged Formula 2 cars. Of course the Italian teams had tailor-made cars ready and running, whilst the British tried to keep on the game with a variety of mainly Bristol-engined specials. Leslie Johnson was convinced that David Hodkin was a genius, and described to the press their plans for an ultra-sophisticated new G-Type ERA. Whilst Prof. Eberan had proved the efficacy of big-tube chassis construction, now Hodkin developed a remarkable frame built from two massive tubes made from magnesium sheet rolled into an oval section, and joined by four cross-members. As details were being revealed, the specialized press became interested, and hence the name. Johnson managed to convince Stirling Moss, by then a full member of the HWM team, to drive the car in a couple of races during the 1952 season. As a payback for his loyalty back in 1951 (when Stirling rejected Ferrari's offer to drive for them in the French and British Grand Prix as, he explained, he was previously committed to drive for John Heath and wouldn't break his word - and we all know what happened when another driver, by the name of Jose Froilan Gonzalez, took that vacant place) John Heath agreed. The first appearance of the car was planned to be at the Belgian - and European - Grand Prix on 22nd June 1952. Stirling Moss recalls the car: "It was intended to combine the best Bristol 2-litre Formula 2 engine with an outstandingly stiff yet light chassis, plus sophisticated suspension and weight distribution and a low center of gravity. The naturally tall Bristol engine was lowered by fitting a dry-sump lubrication system with its oil carried in a separate tank instead of a conventional sump underneath. Hodkin then made the car low overall by offsetting the driver's seat, so I sat beside the center-line prop shaft instead of above it, in a broad virtual sports car body which left only the wheels unclothed. It was all intended to generate so much cornering power that it could compensate through the corners for what the Bristol engine's modest horsepower lost to Ferrari and Maserati along the straights." So, with all these expectations, it would be a good idea to hear Ken Gregory comment on the moment: "The European GP for Formula 2 cars at Spa came next, and our hopes centered on the G-type ERA, which Leslie Johnson had promised would be there. We had waited so long for this fabulous motor car, and in our minds, I am sure, had visualized a really beautiful racing car, something on the lines of, say, a Mercedes or the E-type ERA, both of which were quite classics in appearance. Then, just before practice was due to begin, I saw a rather rough-looking green machine coming down the road, and was horrified to learn that this was the ERA. I wasn't watching Stirling's face closely at the time, but I think that he, too, was bitterly disappointed. Not only was the car squarish and ugly; it wasn't even a true single-seater, yet here it was, turning out for the GP of Europe!" In practice it ran poorly, and it was decided that the engine was below par. Johnson lost no time in arranging for another engine to be flown out from Bristol to Ostend the following morning, but the Ostend customs soon messed that up, so that after much haranguing and arguing, the engine didn't get arrive to Spa until lunchtime. A 14th place in the grid, 31 seconds slower than poleman Ascari was the result of the practice. In the race Moss made a colossal start from the fourth row, and was up to fifth place by means of fabulous weaving and darting, when suddenly the engine locked solid, and burst into flames. The car slid uncontrollably off the track, near Burnenville, smacking into a concrete kilometer post and wrecking the suspension and front end. A connecting rod had broken. Stirling leapt out smartly, with only his shoelaces burnt! Gregory recalls the incident: "It was one of his luckier escapes, for just beyond the point where the ERA finished up was a great mass of barbed-wire fencing. I will never cease to be astonished at the incredible folly of organizers who permit the existence of barbed-wire fencing close to a circuit, particularly in the neighborhood of corners. Later in this same race, the late Ken Wharton had an incredibly lucky escape when he spun on the slippery surface, his single-seater Frazer-Nash skating off backwards and careering straight towards a fence formed of a single strand of barbed wire, about three feet from the ground. With remarkable sang-froid Ken ducked as the car shot underneath, but even so, his clothing was badly ripped on the wire." The Spa crash meant that the second race (the Formula 2 Grand Prix de la Marne at Reims the following Sunday) was to see no ERA, and Moss arranged with John Heath to drive one of the HWMs. 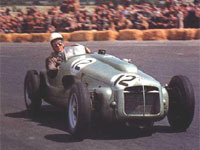 On July 19 the British Grand Prix at Silverstone was going to take place, and Stirling Moss was to drive the G-type ERA. Gregory saw the car again and couldn't resist the temptation of commenting on it: "Although the car embodied many unusual and clever design features, it was a really ugly vehicle, and I didn't feel at all proud that Stirling was to drive it. I may have a 'thing' about it, but I have always rigidly maintained that no car which looks fundamentally wrong has ever gone right, and vice versa. Leslie Johnson explained that its appearance was purely temporary, and that later a better-looking body would be fitted. It certainly needed one. We could, perhaps, have forgiven the G-type its ugliness had it gone well. Stirling so badly needed a good car to restore his confidence but the ERA didn't help…"
Once again the car disappointed, with a 16th place on the grid whilst on the race overheating - and consequent damage to the cylinder heads - forced the retirement though Moss had never been amongst the leaders. An angry Moss recalls: "While I was having these problems Mike Hawthorn was making his name in his cheap and cheerful and uncomplicated but effective Cooper-Bristol, fourth at Spa and third at Silverstone behind the all-conquering Ferraris." The ERA then went better at Boreham (in the second edition of the Daily Mail Trophy) where Moss finished third, behind Mike Hawthorn and Alan Brown's Coopers 20. At the Dutch GP in August, Stirling started from the back of the field with no time recorded in practice, but the engine died on lap 73, although he appeared as finisher but not classified. Both ERA and Moss "jumped" the inaugural National Trophy at Turnberry (one wonders why Stirling chose to miss the wonderful Ailsa Craig golf course and let his rival Hawthorn cruise to an easy win at the same weekend) so they had to wait until the end of the year at Goodwood, for the fifth Madgwick Cup, an absurdly short race run under Formule Libre rules. Those meant that outdated Formula 1 machinery was to compete against Formula 2 cars over 7 laps - just under 27 kilometers! Moss set best 2-litre time in practice before being shunted at the first corner of the race by Dennis Poore's Connaught. Two more races were to see Moss in action with the ERA: in October at Castle Combe, for the first Joe Fry Memorial Trophy, Moss qualified on pole and led the 2-litres for five laps until the steering broke, whilst, finally, at Charterhall the following weekend for the first edition of the Newcastle Journal Trophy, the steering again gave trouble - all probably stemmed from the Goodwood shunt. Nonetheless, Moss managed to get a respectable fourth place. Even if at last the G-Type was proving itself one of the quickest F2 cars in Britain, it wasn't worth much when it was still obviously no match for Ferrari or Maserati internationally. Let's finally hear Moss about the experience: "It was, above all, a project which made an awful lot of fuss about doing very little. By this time I was very disillusioned by the Clever Professor approach to racing car design. I would eventually learn that even the most brilliant concept could fail if the team concerned lacks the manpower and organization and money to develop the inevitable bugs out of it. Even Maserati took a year to sort out a design developed from a preceding model, while it took the titanic resources of Mercedes-Benz to produce a winner from the drawing board, and even they promptly lost a race or two through teething troubles. Against those examples, what chance did poor little ERA stand?" Before the end of the year Leslie Johnson sold the entire G-Type project to Bristol, who adopted its virtual two-seat layout as the basis for their aerodynamic Le Mans Coupes of 1953-'55. In the 24-hour race's medium-capacity classes, David Hodkin's baby finally found its niche. In the thirties, Raymond Mays was one of the hottest prospects in the UK, driving a Riley. Together with wealthy gentleman racer Humphrey Cook he raised the finance to let his friend, Peter Berthon build a beautiful little monoposto. The whole thing was campaigned under the grandeur name of English Racing Automobiles Ltd. and was an instant hit. Four cars were built in the first year, 1934, called the A-type, with 6-cylinder engines of 1100, 1500 and 2000cc. The following year Berthon improved his design to the B-type, of which 13 cars were built until 1938, four of which were converted to C-type specification along the way. One of the C-types was further modified into the D-type, and all 17 cars enjoyed a long and successful career in motor racing. To my knowledge 16 of them are still actively driven today in historic competition, which says a lot about the quality of the workmanship involved. However, Mays and Berthon felt they were outdated by the end of the thirties, and one is inclined to think they were right, because they looked pretty much like the poor relation of a B-type Alfa Romeo when the world was rocked by the sophisticated brainchilds of German engineering. The result was the E-type, a state-of-the-art racer (at least by its looks) and a complete and utter failure on the track! Part of that was the result of Cook's withdrawal as a sponsor and after some fruitless attempts at taming the beast, Mays and Berthon sold the two cars that were built and concentrated on their new baby, the BRM. End of story? Not quite: enter Leslie Johnson, an amateur racer in his mid-thirties with considerable entrepreneurial skills. Late 1947 he bought ERA Ltd. and one of the E-types which he raced himself to some extent, even starting in the very first WC Grand Prix at Silverstone in 1950. His main business with ERA became research and development consultancy, and to further its reputation Johnson embarked on an ambitous project: an F1 car for the new 2.5-litre formula! As a stop-gap, he commissioned David Hodkin to design him an F2 car, which was kind of fitting because all the previous ERAs had been designed to Voiturette (=F2) rules and did only appear in proper GP racing by accident. The same thing happened to the new G-type when F1 collapsed in 1952! Incidentally, the missing letter ("F") was probably assigned to a sports car project that was sold off to Jowett. The car Hodkin came up with was big and bulbous and used an engine that was essentially designed by BMW in 1936. Not too hot! One thing Johnson did get right was driver choice for he managed to install Stirling Moss into the cockpit. The son of twenties' racer Alfred Moss was already tipped for stardom at the time after competing and winning in a wide variety of cars, most spectacularly in F3. Aged 22, he set to the ERA with a will but could not wrench any sort of result out of the car. At its debut in Spa he qualified tenth but crashed on the first lap. The car was rebuilt and Moss qualified 16th at Silverstone only to spin twice and retire. At the Dutch GP he ran seventh near the end when the engine let go. A handful of minor British events brought a best result of third and another crash and rebuild and that was that. The car was sold and Moss left the team to become the maestro we all know. Johnson continued to labour around with a 2.5-litre engine study until he suffered a heart attack and retired from business. ERA was sold again and disappeared from the racing scene, apart from its fleet of historic racing cars.